Welcome to the last pattern in our Christmas in July series! If you've missed any of the other patterns you can find them all here! I did a lot of boy and girl versions in my forest animal series and that's exactly what I wanted to do with these two as well. 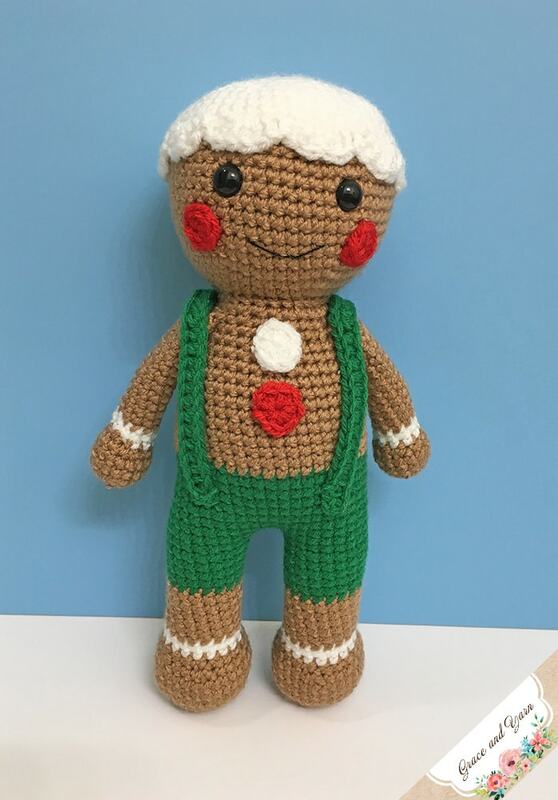 Below is the free pattern for Snap the Gingerbread Boy, head over here if you would like the pattern for Ginger the Gingerbread Girl! A lot of you shared some cute edgings you added to the skirt on the Amy Doll and it inspired me to add a decorative edge in this pattern. The scallops remind me of frosting and seemed quite fitting! 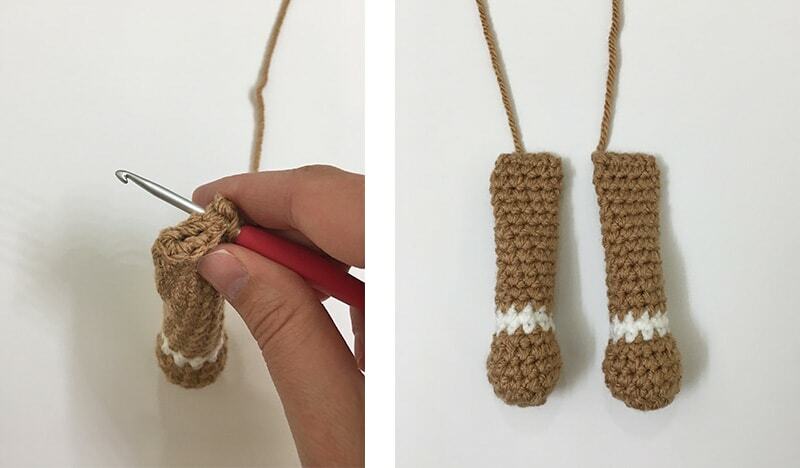 If you are new to crocheting stuffed animals, head over to my Tips to Learning Amigurumi page to get started. 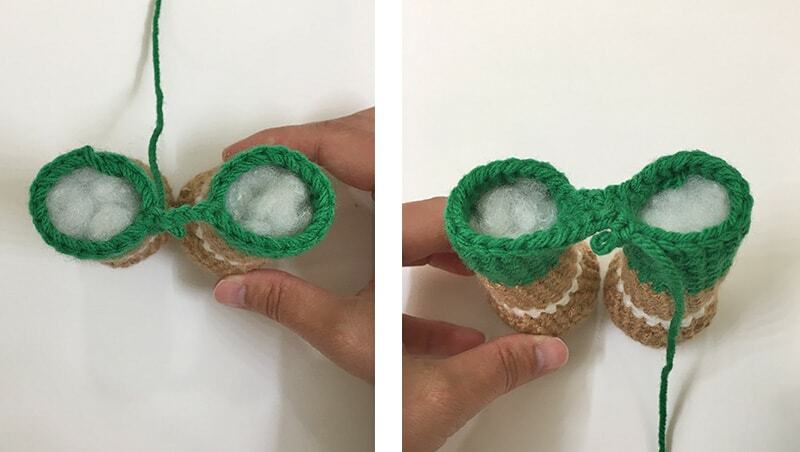 I go over a lot of the common techniques you'll see in the pattern, plus photos to help you through it! Be sure to also join the Grace and Yarn Crochet Group on Facebook so you can share your work and ask any questions you have along the way! 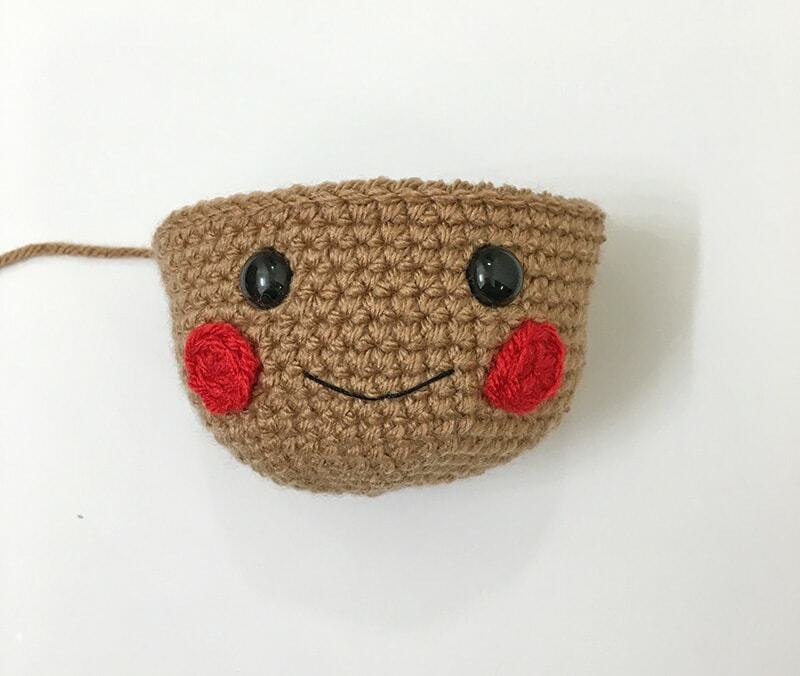 If you plan to make this for a little one under 3 I recommend these crochet eyes as an alternative to the plastic safety eyes! 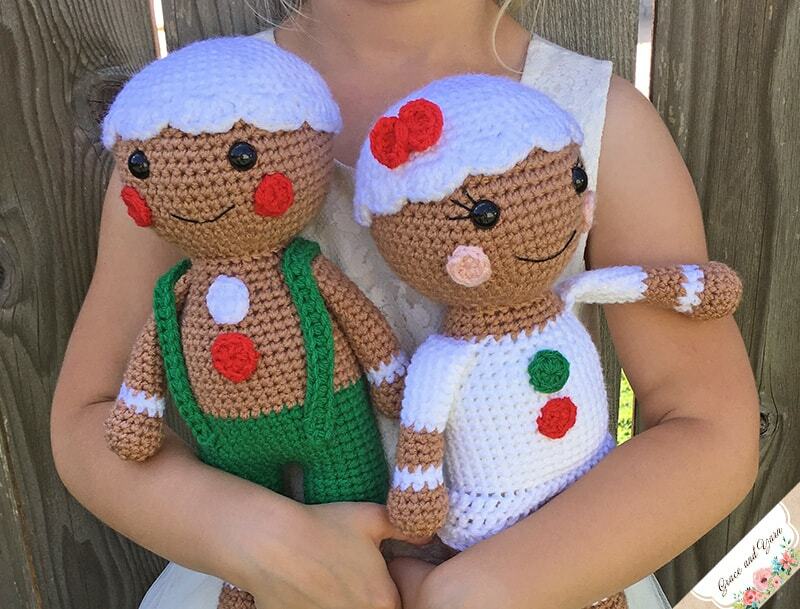 Want more free Christmas patterns? Find them all in this roundup! 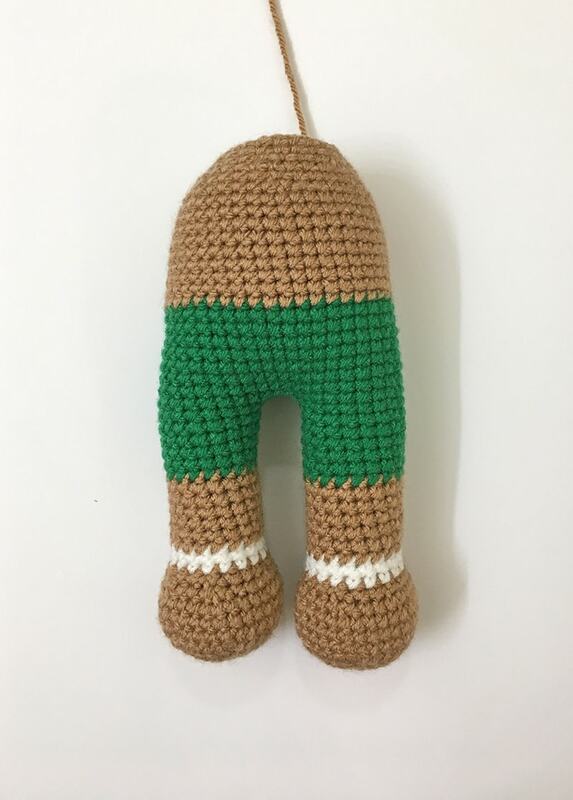 This pattern measures about 13 inches tall. Round 25: Chain 3 and attach to the first leg with a SC, SC in the remaining stitches around the leg, when you reach the chain make a SC across each of the 3 chains, SC in the remaining stitches of the next leg and SC across each of the 3 chains (42 SC) This completes your join and is where your next round will start. Note: Here is where we will add the facial feature before we start closing the head. Insert the eyes between rows 15 and 16, 7 stitches apart. Using crochet thread or yarn embroider a smile by making a ‘U’ or ‘V’, I placed mine centered between the eyes 4 rows down. 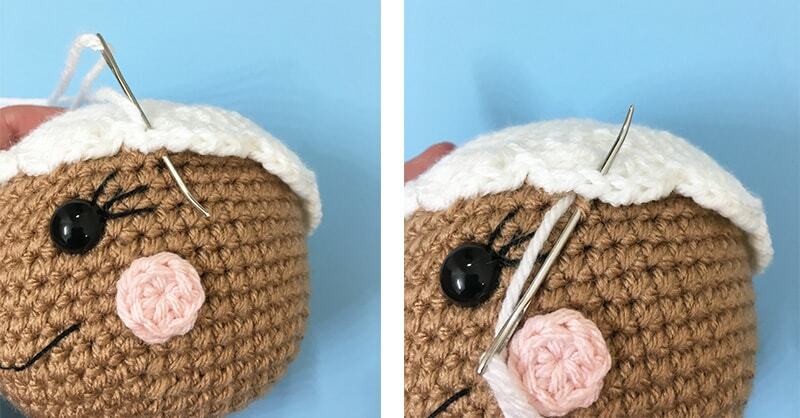 Lastly, sew the cheeks between rounds 11 and 13 just outside of the eyes. 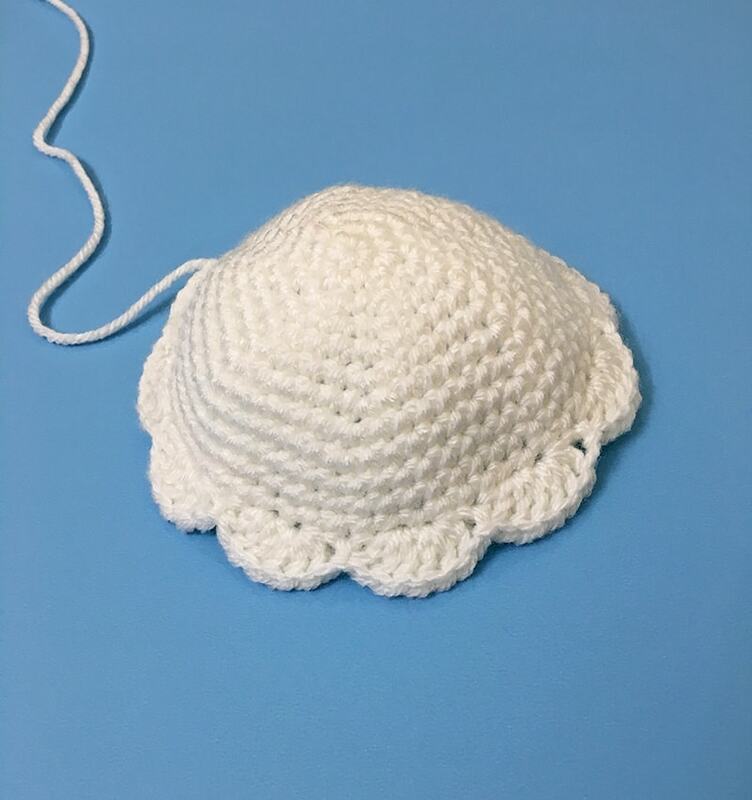 Round 13: Sl st, *3 DC in each of next two stitches, skip 1 stitch, sl st, skip 1 stitch* rpt around for a total of 11 scallops, join with a sl st.
1. Sew the frosting cap onto the head. For a cleaner look when sewing grab a stitch from underneath the cap as pictured below. 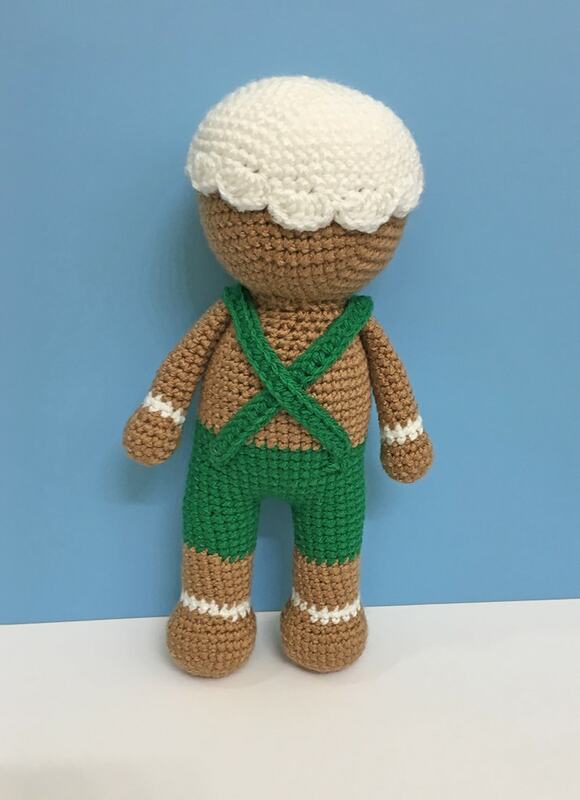 Your gingerbread doll is complete! I hope you've enjoyed this pattern, thank you for stopping by! Beautiful dolls. Thank you for sharing your pattern. My grandson will love it.